Our breakthrough patented Dermastem Advanced Serum revitalizes the skin’s appearance, restoring and maintaining its youthful vibrancy. This rejuvenating serum is proven to visibly reduce fine lines, age spots and wrinkles while gently tightening your skin with its powerful advanced formula that deeply penetrates your skin to create optimal results. Dermastem® Advanced proprietary blend of natural ingredients including AFA, Aloe Vera, Fucoidan, Cehami and Vanilla, was documented to increase the proliferation of skin stem cells by more than 112%. The serum promotes the natural healing process, reviving and regenerating skin. Dermastem Advanced contains absolutely nothing artificial. It is an emulsion of dozens of ingredients gathered from around the world, that work individually and in concert to regenerate the skin, while also fighting the effects of oxidative stress and other harmful internal and external triggers that cause premature aging of the skin. Cold processing preserves the very fabric of each plant for unprecedented effect. Our serum’s all-natural ingredients provide the ideal environment for the regenerative properties of your skin’s adult stem cells, while producing elements essential to youthful-looking skin. Stemtech’s scientific team has worked for years to perfect just the right formula and the best processing methods to revolutionize the skin care market and bring unprecedented results to men and women everywhere around the globe. Our unique emulsification procedure blends the ingredients without the use of chemicals. Our clinical results demonstrate that dramatic and visible improvements occur rapidly with only a twice-daily application of DermaStem. This revolutionary product works to reduce the signs of premature aging. Dozens of organic or wild-harvested plants with individual properties to fight the signs of premature aging have been assembled from around the world. The DermaStem formula is the result of generations of proven results, all tested in the laboratory. Plant extracts are obtained using a cold infusion process. The delicate essences of all plants are preserved. Each anti-aging ingredient is delivered in its most powerful, effective form for greatest benefits. No petroleum derivatives, preservatives or chemicals have been used. The all-natural emulsion of natural oils disappears instantly into the skin for immediate effect and no residue, without potential toxicity. 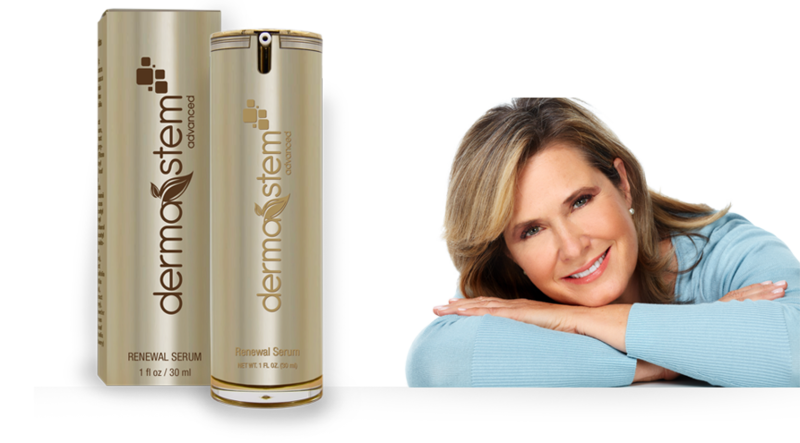 Exclusive to DermaStem: A blend of six Cytokines that stimulate the proliferation and migration of the skin's adult stem cells. Outer vibrancy comes from renewal and rejuvenation of the surface of the skin, producing a more youthful appearance. Outer vibrancy comes from renewal and rejuvenation of the surface of the skin, producing a more youthful appearance. Natural, novel ingredient extensively studied for safety and efficacy to brighten skin and reduce age-spots. Skin has a more vibrant glow in addition to a smoother, more even appearance. Promotes brighter, smoother, younger-looking skin, starting in 7 days! Black Mamaku, Moringa, Rosa Rubiginosa and Sangre de Drago, which are used on the skin by natives of various parts of the world and improve the appearance of the skin. Our blend of six Cytokines to support the skin's own renewal process. Dispense 1 to 2 pumps onto fingertips and smooth gently over entire face and neck. Apply twice daily, after thoroughly cleansing your skin. Wait a couple of minutes before applying moisturizer, foundation, sunscreen or any other desired cosmetics.